« Events: Cocktail History and Chili Powder History! 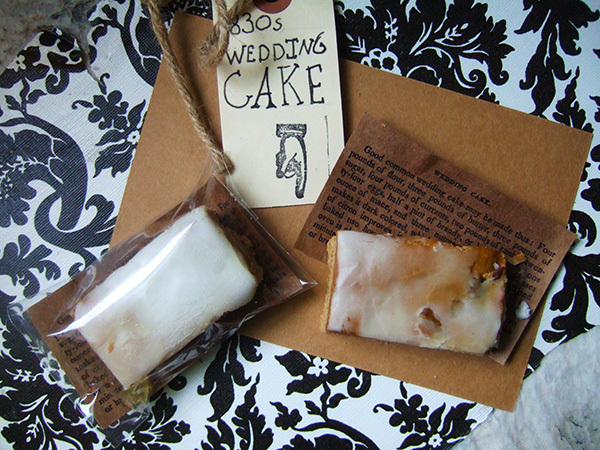 Historic wedding cake, passed out as a wedding favor. No. I was not. Why? Because historic wedding cake is disgusting. Ok, maybe that’s not fair to say. It’s just not to MY taste. Our actual wedding cake was a spice cake with pecan, salt and dulce de leche filling and cream cheese frosting, baked from scratch by my mother, an award winning baker. That’s my kind of cake. But I did decide it would be a sweet and meaningful wedding “favor” to send everyone home with a slice of 19th century wedding cake. I didn’t end up using the wedding cake recipe that inspired the name of this blog; I followed the recipe for “Ohio Wedding Cake” from Miss Beecher’s Domestic Receipt Book, published in 1846. It used almost the exact same ingredients and proportions as Lydia Maria Child’s 1830s recipe, but gave better instructions. They were more clear, and revealed some of the specifics of 19th century baking any good Victorian housewife would have known, but I did not. This was a quick recipe to put together; I baked and frosted three recipes (three large sheet pans) in a day. I used mixed fruits from King Arthur Flour as well as raisins, brandy, red wine, nutmeg, cinnamon, mace and cloves to flavor the recipe. It was baked at 350 degrees for about an hour. It would have had a meringue frosting, but egg based frostings are not durable in the summer heat. I made a glaze from powdered sugar and water instead. I wrapped little rectangles of cake in self-sealing bags, with a copy of the recipe behind it. The cake was a huge hit. My mom loved it. Most people liked it. And those that didn’t, appreciated the experience. 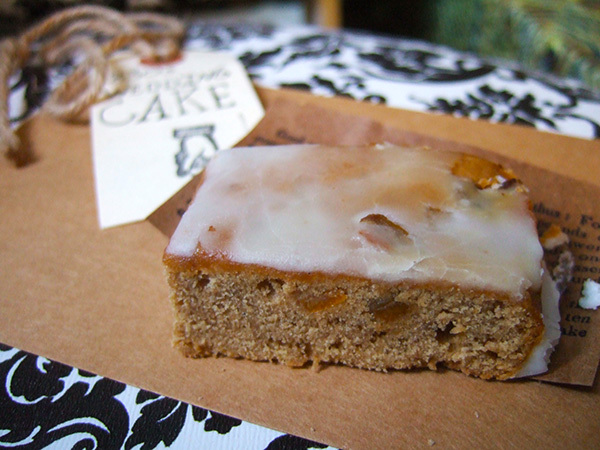 And although the cake was of the dense and heavy fruitcake variety, it was actually better than I expected. Wedding cake: wrapped with a recipe. Congratulations!! What a lovely and perfect favor for your guests! Thank you! It worked out well, and many people thought it was baked/wrapped professionally! I’m glad it turned out so well. I agree with you about historic wedding cakes, but this looks delicious, and I love the way you wrapped it. Congratulations on your marriage! So I just read this to my British husband and apparently this is basically what they still make as the “traditional” wedding cake in the UK! the main difference being that they appear to use black treacle instead of molasses and they have a marzipan and fondant layer on the outside like Christmas cake. No Kidding! I had no idea! In South Africa as well! My partner really wanted to have a traditional SA wedding cake for our wedding, so she baked it herself as no one here really knows how to make it. It was a pretty boozy, dense, but very moist cake, with the marzipan layer under the fondant layer. The guests loved it and we had wedding cake leftovers for several months (the alcohol keeps it from getting moldy). I love the fact that your mom baked your wedding cake! Was it a traditional layer cake? The Ohio Wedding Cake is a beautiful recipe and so attractively packaged. I just located my father-in-law’s(age 89)recipe for cornbread. I have a copy of his original recipe that was his grandmother’s. No mixing method is given–just ingredients. I treasure it! She made many three layer cakes we put on cake stands and cake plates and decorated with glass birds (christmas ornaments). I’m getting my photos back form the photog soon, so I’ll put some online. Have you made the cornbread recipe? congratulations..lovely and amazing wedding cake..i didn’t see the 19 century wedding cake..